Below is the schedule and pertinent support information for currently released Oracle Database base releases and patch sets. A patch set is only added once it is released on the base platform, so no future patch sets are shown. The table below represents the most accurate information Oracle can provide, and is updated frequently. Unless otherwise noted all information applies equally to all editions of Oracle Database – from a maintenance point of view they are exactly the same. 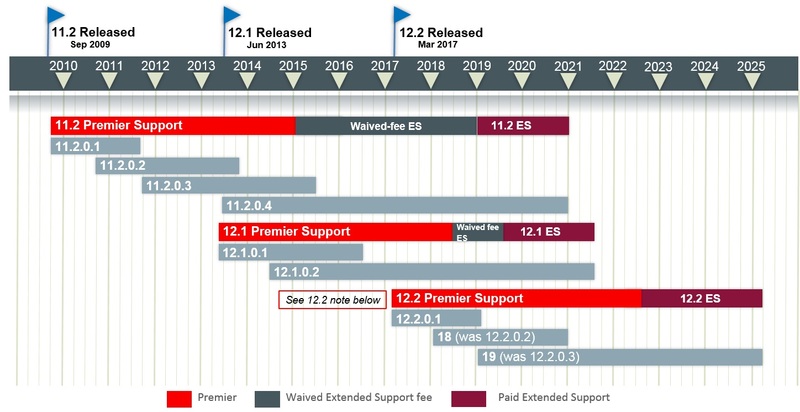 To help you plan ahead, below is a roadmap of patch sets for Oracle Database major releases 11.1 and beyond, showing planned release dates and the duration of their support lives in relationship to the overall release life. The chart is by nature somewhat simplified so be sure to read the details below it to help you interpret it correctly. Information is shown for current major releases since 11.2. Patchsets and releases come out on different platforms over time. Once released on the first platforms (usually Linux), the schedule for release on other platforms will be added to the table above. Release 12.2: New releases will be annual and the version will be the last two digits of the release year. The release originally planned as 12.2.0.2 will now be release 18c, and the release originally planned as 12.2.0.3 will be release 19c. Releases 18c and 19c will be treated as under the umbrella of 12.2 for Lifetime Support purposes. The current plan is for Oracle Database 19c to be the last release for 12.2. This may change in the future to Oracle 20 as the last release for 12.2. Please read the Document 742060.1 for further details.